In addition to being Family History Month, October also is German American Heritage Month—or at least the second half of it. The commemoration actually runs Sept. 15 to October 15, roughly corresponding with Oktoberfest. German is America’s largest ancestry group. According to the Census Bureau, nearly 50,000,000 Americans claim German ancestry. Do you fit into that group? I certainly do. My Germans arrived in the Cincinnati/Northern Kentucky area mostly in the early to mid-1800s. They were near the beginning of the era that saw the largest influx of German immigrants, between 1820 and World War I, when nearly 6 million of their countrymen immigrated to the United States. The first significant groups of Germans arrived much earlier, in the 1670s, and they settled primarily in New York and Pennsylvania. A wave of political refugees called the “Forty-Eighters” arrived after 1848 revolutions in the German states. Immigrants before 1850 were mostly farmers. After 1840, many headed for cities and established “Germania,” or German-speaking districts. 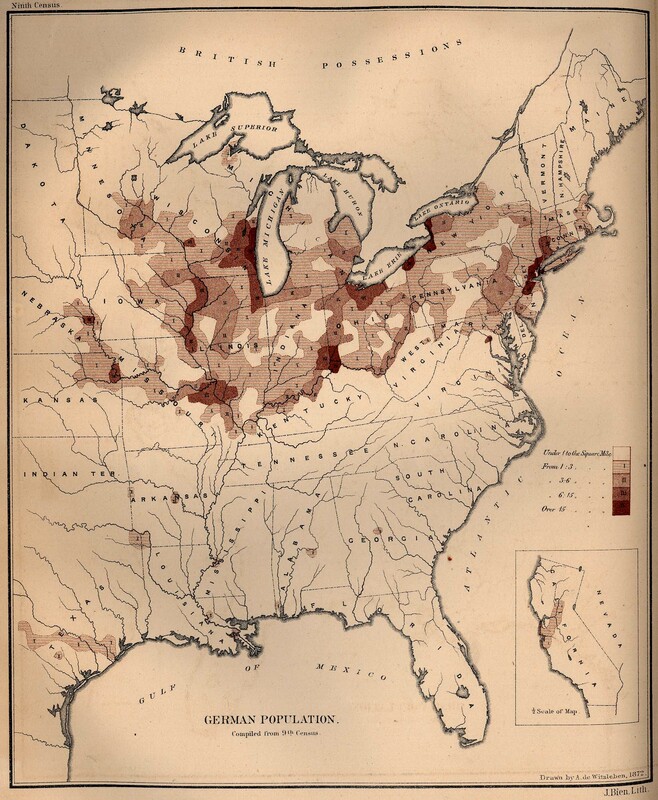 This 1872 map, part of the Perry-Castañeda Library Map Collection, shows America’s German population from the 1870 census. Note the dark shading over the northeast and southwest corners of Ohio, along Lake Michigan, and in New Jersey. By 1900, the populations of Cincinnati, Cleveland, Milwaukee and Hoboken were more than 40 percent German. We can thank our German ancestors for the Christmas tree, chicken fried steak (whose origins are supposedly in wiener schnitzel), the hot dog, “Here Comes the Bride” (composed in 1850 by Richard Wagner) and of course, a variety of beers. Learn more about the German Genealogy Premium Collection now in Family Tree Shop. This entry was posted in Genealogy Insider, German Genealogy, International Genealogy Research and tagged shopfamilytree.com sales. Bookmark the permalink.